A drop-in bedliner is just hard plastic that sets on top of your truck bed and is not tied down to prevent debris from getting underneath it, or even prevent it from moving around or shifting. When you take a close look under your drop-in bedliner you will most likely be shocked at what you see: damage that can lead to rusting. 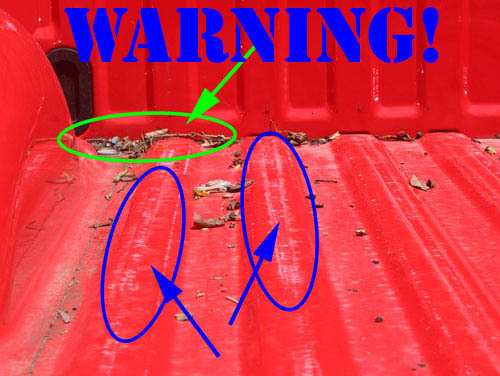 Could all these scratches and random debris be lurking under your drop in bed liner? Here is an actual pickup bed after we pulled off a drop-in plastic bedliner. We actually pulled it off at night and the debris and bed were soaked! We had to wait for the next morning to shoot a picture. A drop-in truck bedliner thoroughly scratches your pick-up bed. A hard plastic surface that is constantly shifting will not only rub against the factory paint job, but it will wear it off and scratch the bed of your truck as well. This may not seem important at the time because you can easily hide the damage by putting the drop in liner back in, but it really shouldn’t make you feel any better. Essentially, all you are doing is putting the liner that scratched your bed back into the truck bed to scratch it some more. After all, you bought the drop in liner for “truck bed protection.” If the bed was being protected properly, there would be no extra scratches and chipped paint. DualLiner prevents scratches from being formed and protects your paint because our soft rubber ZeroSkid mat doesn’t slide around. As an added bonus, it cushions against impact. Ouch! Those scratches caused by a drop-in bedliner go down to the base primer coat. This drop-in liner was in the truck for two years, and it’s close to getting down to bare metal. Have you ever hauled mulch in your truck bed? What about shrubs? Or gravel? How about anything that has lots of small pieces, like screws or nails? Have you ever parked your truck under a tree and leaves landed in your bed? Have you ever driven your truck outdoors (just kidding)? If you answered “yes” to any of these questions, there is a good chance you have debris under your drop-in bedliner. You may ask, what’s the big deal? 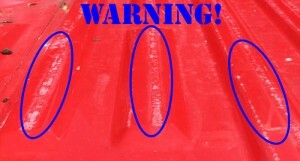 Well, the debris will sit under your bedliner with no place for it to escape, trapping moisture which can lead to rust. DualLiner doesn’t allow debris to get under the bedliner. Water by itself is OK getting under your bedliner, but online if it has a way to drain. Your truck’s bed was designed to come into contact with water which is why it has built-in drain holes. Some drop-in bedliners will trap water by blocking access to these drain holes. This is a huge issue because it will cause the bed to rot and decay. Water needs to be able to flow like the factory intended. DualLiner lets any water drain from your bed because it allows free access to your factory drain holes. We also allow air flow with further helps keep your bed dry and free from rust. Here is a cross-section showing the nibs under the ZeroSkid rubber mat, allowing air to flow and free access to drain holes. How does DualLiner compare to drop-in bedliners? Compare for yourself! Our truck bed liner is a much better product for bed protection than a drop-in bedliner. DualLiner will not damage the bed itself, the ZeroSkid rubber mat is made to stay in place and will not scratch the truck bed. The truck bed mat also allows for proper water drainage in your truck bed. Also, if you think there is some debris that is under your DualLiner it is easy to remove it. Simply pull the mat out of the sidewalls and fold over the mat to clean out the debris. DualLiner provides great protection and will help avoid damages that occur underneath your bed liner. DualLiner is the best bedliner and the only truck bedliner that works. 1994 Chevy 1500 8′ BED? DualLiner is available for Chevy trucks 1999 and newer at this time. Got 1999 Dodge Ram 3500 dually 8′ bed. Will a dual liner work for me? Hi! DualLiner only covers Dodge Ram from 2002 to 2016, we do not make one for the 1999 model.